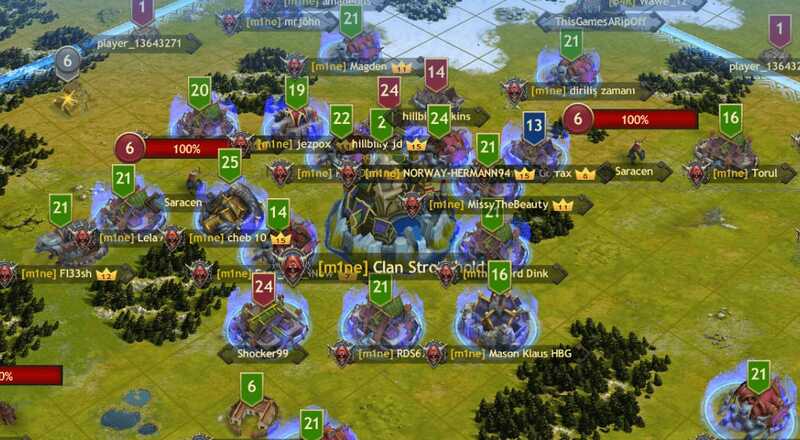 In the lands of Vikings: War of Clans, it is the natural way of things, the natural progression of our realm, to see Kingdoms boom, then slowly diminish over time. Brave adventurers move onto new frontiers, others simply fall in battle against their enemies, and a few live to retire from the battlefield. This is normal, the way that it has always been, and unless the gods change something, this is the way it will be for our foreseeable future. However, this does not mean that as a Kingdom’s population declines, so too does its might. A canny Kingdom can trim the fat and end up mightier than ever. Competition is fierce in the early days of a Kingdom’s founding, as many are seeking to write their names in the history books for all time, or simply to strike it rich, gathering massive resources and thus increasing their influence and power. Unfortunately for many, they fall seeking these dreams, or are crushed by those more skillful, or more powerful. Yet, those who remain will eventually band together, consolidate their forces and make a formidable army, one that will protect the honor of their homelands and its people. This is exactly what we have recently seen in the lands known as Krastardob. As reported last week, the Valhalla Damned finally broke their downtrend and claimed a massive, monumental victory as their own. This has propelled them back onto the scene and others have taken notice. 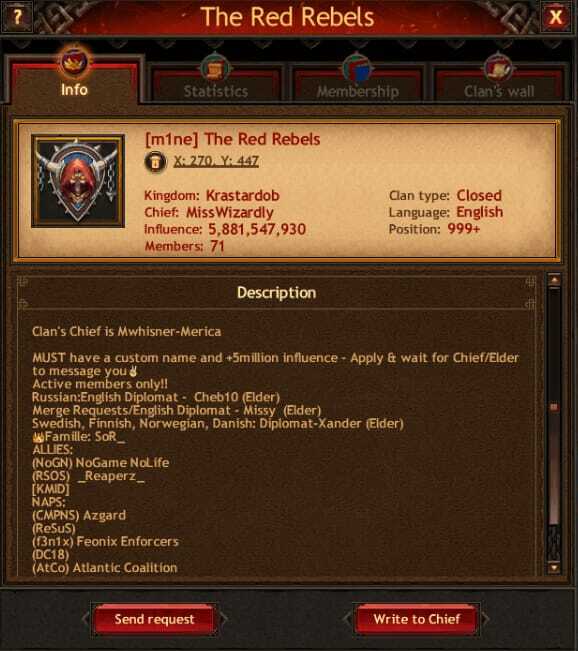 As a result of this, and the actions of their ex-Chieftain, they have been presented with an offer that many could not refuse, a merger with a more influential and more powerful clan, the Red Rebels. 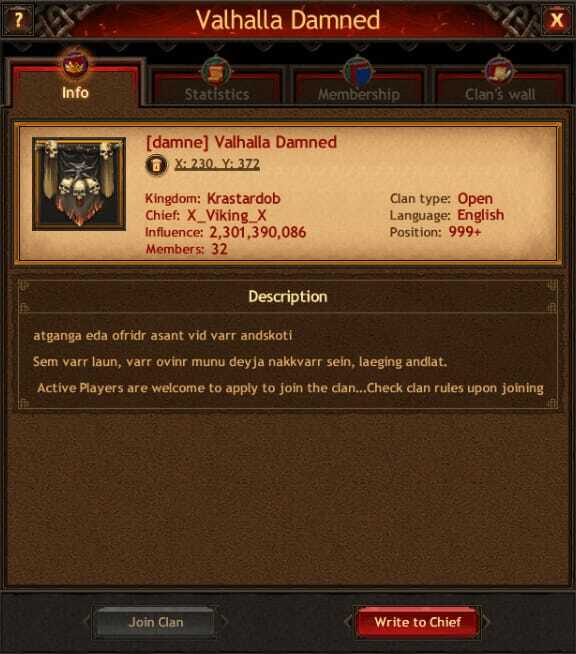 This was gladly accepted by a large majority of the Valhalla Damned membership. Already we can see the dust clouds in the distance as members from the Valhalla Damned depart their "hive" and move to the protection of the Red Rebels’ homelands, planting their roots and begin adding their defense to that clan’s "hive". To those who think that this has been a one-sided gain for the Red Rebels, they are sorely mistaken. The combinations of these two clans has seen the active roster of the Red Rebels balloon in size, meaning that they are collectively that much more powerful in events and thus will experience a sharp increase in capabilities and rewards. In addition to this, the old Chieftain of the Red Rebels, MissWizardly, was so impressed with the leadership of Marc the Marauder, the old Chieftain of the Valhalla Damned, that she has stepped down and passed on the reigns of leadership to this experienced and skilled leader. 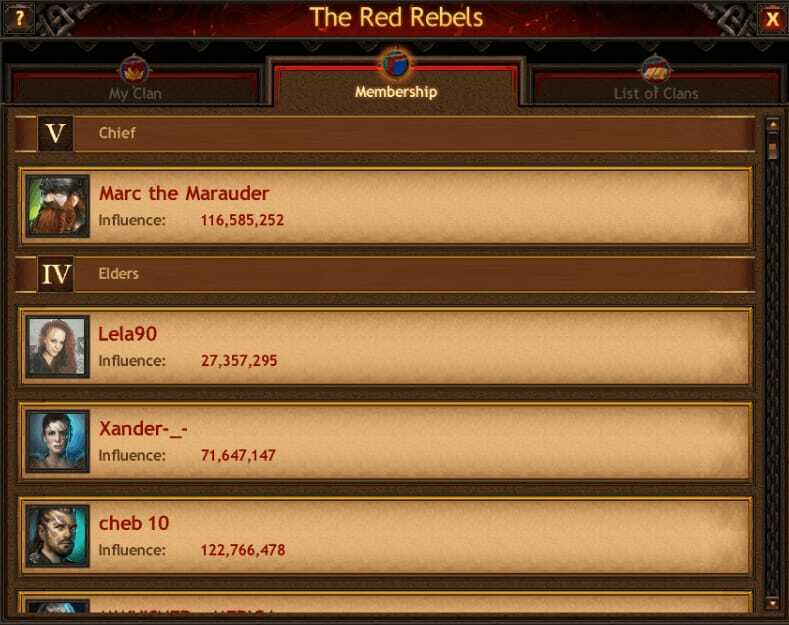 What the future holds for the Red Rebels is now anyone's guess, but we at the Chronicle can speculate and assume that now that these two mighty clans have combined their might, the possibilities are endless and the future is bright indeed. Onward to victory, onward to glory!